The crossword form is a striking visual-verbal icon. A very particular image which invites the participation of the reader. Or perhaps, the imagined participation of the reader (who thus becomes a kind of directed writer.) And it challenges readers to search their own knowledge (collection) of words and their meanings by being prompted with the definitions or synonyms of these words. The ‘jumble’ aspect to this is that all these words elicited through their synonyms or meanings, yield the hidden word, the word to be filled in in the circles at the top of the page. In this case—spoiler alert—your name. Which, I note is also a construction. It was made by your family. And then, I believe, modified/added to by you. 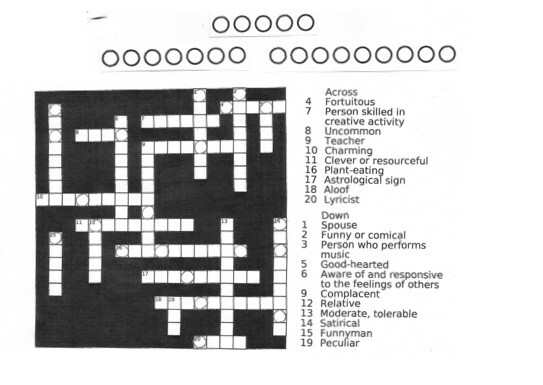 This kind of jumble-crossword is often associated with school and childhood, especially when all of the clues point to aspects of a person. This makes it a particularly apt choice for ‘biography.’ And: I think of how people are sometimes taught to ‘read’ a poem: at the end of the process, they are expected be able to find the correct and hidden ‘meaning’ if they’ve decoded the poem properly. They could write this hidden meaning at the top of the text. Another poem ‘solved’! My name is barely mine. And it’s rarely a solution for anything. Are poems solutions or dissolutions? The empty crossword is already a suspension, itself. Are poems puzzles? Depends on your GPA. As a writer, I don’t wanna know any of the answers before my readers. And I never want to write the same book thrice. I want to write books as a stranger to them. How does this appropriated verbo-visual form (the jumble-crossword) engage with the tradition of visual poetry? Respond with a dance. Tkelkaknaosfdnlasikaliasdkvoawlknloiansd! Asivnowaid! Aks mdvaw pnrevlknhdf! Ksaoifdngoa! Asfdghaowriuo powpeojp aroiwrjsaindfv wrfawf! Keyboard dancefloor fingertip nutbush cha-cha-cha! Gary, thank you for all these generous + attentive added-up word-quest ions! Here are some direct sentencings: Jackson Mac Low’s gatha aren’t exactly crosswords, but their graph paper visual-sounds echo the consciousness of word games. In Bloody Jack, an outlawish verse-biography of the notorious Krafchenko, Dennis Cooley includes “cross words”—the first crossword-poem I ever saw. And would it be too nobvious to suggest sinews pulling from Hannah Höch and Raoul Hausmann’s newspaper collages? Maybe nostalgia is appropriate(d)? Visual poetry is the most invisible poetry, which may be a bit like saying russets make the starchiest mashed potatoes. ‘Jumble’ actually likely perhaps bespeaks my own vispoeming history and frustrations therewith. Real confessional biography: My first book of visual poetry was originally written for graduate school. Trying to convince 94% of the humans in my life that rhapsodomancy (Coach House, 2010) equals poetry is stupid. I’ve since challenged myself to manufacture radical forms & themes that could entertain certain family members. Hence the mad-libs of easy peasy (Snare, 2011). My ideal book of poetry would contain only blank pages... although many publishers haven’t shared this idealism. I know all writing is pactsive (part active, part passive), but I want to facilitate poems that are incomplete/interactive, that include search bars and disappearing ink. Most concrete poems are chances for glances. I want to bake slow-cooked pages. And clearly this work engages within a ‘tradition’ of biography by other means. This autobiography of kevin mcpherson eckhoff wasn’t written by Gertrude Stein. You yourself outsourced it. How did the commissioning of the biography affect its outcome? And no cheating. Answer the question yourself. Here’s a guess: self-fulfilling prophecies. Also, here are some ACROSS clues: Lyn Hejinian’s My Life, Joe Brainard’s I Remember, Chris Eaton’s Chris Eaton: A Biography, D.A. Powell and David Trinidad’s By Myself: An Autobiography, Dana Teen Lomax’s Disclosure. Outsourced. Cooperative. Gangbuster. Dance party. Shareholding. Language is so poly-tickle! Which is the passe-partout? What a fucky pretentious term. Either a master key or master lock. In my life, best friend is synonymous with Jake Kennedy, and for six years we’ve been harvesting words from folks face-to-farce throughout the Okanagan Valley to stew a novel. He characterizes these contributions as “donations,” which I suppose implies charity. For their biography, ‘I’ have sent around general Facebook invitations, as well as handed out submission request slips to (and greymailed) specific strangers, family, colleagues, enemies, etc. Each time I invite someone, it feels like a slightly different me asking, strategizing, sizing up the potential writer. Should I ask famouser poets who could add to the manuscript’s street cred? Or how should I pitch it, say, to my dad? I’ve tried to be boldly indiscriminate. And only my brother-in-law responded to my request for villainous words. While the final outcome is still out combing, working with bf on our community novel showed me how one of my privileges as a poet means having access to the experience of being published, and I realized I could share this honour through authorship as solicitation. It’s been inspiring to see how previously unpublished contributors demonstrate mad awe-respect for the process. They’ve been beautifully genuine and ingenious. “What’s wrong with that guy?” Aunty Julie, author of ‘Jumble’ in reference to your questions. I’ve tried found poetry, now I want lost poetry. Lost as in defeated. This singular piece was designed by my aunt-in-law Julie. When she’s not running a tree planting crew, about a month every summer and winter, she lives with us. Her and I compete in weekly crossword-offs. Our word-agility is fairly evenly matched. Art appropriates life. This visual-poem-puzzle is a clue to our relationship. I’m actually aiming to relational aesthetics. It infects my lonely numbskull: How might Marina Abramović and Allan Kaprow’s performances sublimate into poetry? Perhaps Rachel Zolf’s ‘Tolerance Project’ and ‘Three Words Per Poem’ by Gregory Betts are two examples. I suppose the act of solicitation could be considered a kind of performance art, too. Huh. Maybe that’s the truth of this poetry, and the words are mere evidence of this conceptual interaction… conception in a more biological sense. It’s been a startling gift to read people’s interpretations of ‘kevin mcpherson eckhoff’. And maybe there’s another sleight of hand: just because ‘relationship’ is synonymous with ‘perception' doesn’t mean these truths are tenuous. Most of the descriptors are very positive. The grammatical connections in “Jumble” are implied: the form presupposes an understanding of how these elements connect. All of these words and meanings form a cluster (an organism of relationships) of words which are description of a supposedly singular subject: the object often identified as kevin mcpherson eckhoff. There is something of an ancient charm or Kabbalistic formula to this. Your name is actually formed of individual letters which are drawn from attributes which pertain to you. At the same time, it’s childish and simple. Charming. And probably was made by one of those online word puzzle generators. Is this what passes for biography now? Is this how we mediate self? What’s your average score in mini-putt? I hope so much of yes! Summation and exponential. Windmill. Par three. At some point in my childhood I began dressing myself, but I don’t remember exactly when. I’ve never been really singular. The connection of letters into sentences echoes the collection of people into communities. Biography never was passes. The archeologist constructs the spirits of extinction and its victims. My organism is haply finite. Ubiquitous possibilities of error inject hope into my object. And that is the coveted state of visual poetry! In the 21st century, we’ve all become online puzzle generators. Like Kenny G, I’m all puttputt green about soliciting readership, yet instead of single-stroking a whole of a thinkership, I’m five-ironing for a feelership. Fore! How does using a jumble crossword engage with notions of outsider art, popular culture, and the conceptual? I’m thinking it asks: Is this kind of form ‘poetry’? Is any form ipso facto poetry or does it depend on being artfully placed within a ‘poetic’ context by a ‘Professional and Fully Licensed Poet’ (perhaps we should image the license more like a dog license rather than a medical one)? Lye sense. Lies hence. So much poetry passes as inside joke, or rather, inside solemnity. Julie hasn’t read Bloody Jack or Barthes or Bern Porter, but she knows what can and how be poetry! That’s poetic justice, Ecclesiastes-style: All is vanity. My creative writing students have schooled me this way: considering the anything as “poetry” asks us to reconsider intensely the valence of the language of the anything. Whatever gives the reader a high brow or a low brow is my kind of poemexperience. As an academic non-contact sport, poetry can become highly competitive among teams. Outsider artists are rogue players who sometimes invent rules for the love of the game, not the trophies. I’m happy with dishonourable mentions or discharges. For sinstance, BJ Snowden convinces me that both sides of average are extraordinary. Impressive art is not necessarily interesting art. And i want interesting art in my face and from my face. And then I filled in the crossword with a bunch of wrong answers. I got the biography of someone else entirely. Someone I chose to read as me. And then that person wrote a few entries for this project by and about the object often identified as kevin mcpherson eckhoff and then asked him about the very same project. Once I tied my shoelaces into a Mobius strip and I was able to do pratfalls in more than the usual four dimensions. You are the right answer! Mob = i + us! This open source personuscript will be born of BookThug in the next eventualness, but its nightmare will go on and dawn an awed and addend a nod goon. Just like the epidermal vanity of this exquisite Frankenstein corpse is breathed with lyric lightning bolt traditions, its lifespan aims for modernist desires of supreme eternal glories. See C-Bök’s Xenotextmessage experiment. See Andrei Gheorghe's The Longest Poem in the World. See Gerty Stein’s The Marking of Americans. The infinity of the partiality of the biographical of the indefinitely of the infidelity of the visual of the humility of the mortality of the ephemeral extorts a hearty romanticization that means forever. Which chances to say, this book is a wound that’ll never heal... so please help it scab over by sending contributions to kevinmcphersoneckhoff.wordpress.com/their-biography/. Or read sum of its parts of it from above/ground press. kevin mcpherson eckhoff as visual poetry equals rhapsodomancy (Coach House, 2010) and plus the easy peasy (Snare, 2011). Most book recent today is a Forge (Snare/Invisible, 2013). Check out some please with journals why not, like West Wind Review, Fact*Simile, Rampike and Open Letter. Because beside his best friend, Jake Kennedy, and making years go by for a one-day Death Valley: A Community Novel. Heckles learning writers at Okanagan College. He family beauty and joy planted—heliotrope—in Armstrong, BC. At this chance, currently, summer, to judging the 2013 bpNichol chapbook award, smiling.